Royal Lahaina Resort's Lahaina Kai Tower is now open to guests after a $30 million refurbishment. Shown is an oceanfront room. Maui's Royal Lahaina Resort is tempting guests to stay in one of its garden-view cottage rooms or a new ocean-view luxury guest room in its 12-story Lahaina Kai Tower, with the offer of a fifth night free offer on all stays of five nights or more. Every fifth consecutive night's stay will be free from Oct. 22 to Dec. 20. The offer marks a return to room inventory, following a $30 million refurbishment to the resort's 333 guest rooms, suites and public corridors of the Lahaina Kai Tower. Guests will enjoy decor and lavish appointments hand-selected by Philpotts & Associates, an award-winning local design firm. Sample pricing for five nights in a garden-view cottage room is $800 plus tax per stay, based on double occupancy, and $980 plus tax per stay in a Lahaina Kai Tower ocean-view room. Both are subject to availability. 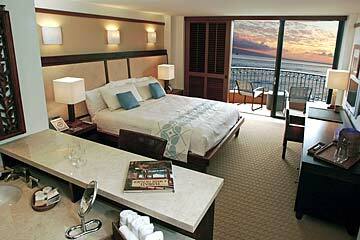 The Royal Lahaina Resort is at 2780 Kekaa Drive in Lahaina. For more information and reservations, call toll-free 800-22-ALOHA (222-5642), or visit www.royallahaina.net. Aloha Airlines now offers the convenience of interline electronic ticketing with Korean Air and Air New Zealand. The new e-ticketing agreements make it possible for Aloha and Korean Air, and Aloha and Air New Zealand to offer through check-in for travelers whose itinerary includes flights on the other airline. In addition to issuing interline e-tickets, Korean Air and Air New Zealand can also issue boarding passes for connecting flights on Aloha Airlines. In July, Aloha began interline electronic ticketing with Japan Airlines. Aloha now has e-ticketing capability with 13 airline partners: Korean Air, Air New Zealand, Japan Airlines, American Airlines, Air Canada, Continental Airlines, ATA Airlines, Delta Air Lines, Hawaiian Airlines, Northwest Airlines, United Airlines, US Airways and Island Air. For information and fares, visit www.AlohaAirlines.com or call 484-1111 on Oahu, or 800-367-5250. Kamehameha Schools Maui invites the community to its Pukalani campus to enjoy a free evening of Hawaiian films, entertainment and cultural exhibits, during its film festival "Ho'oluana," from 5:30 to 8:30 p.m. Wednesday. The event features "Passing the Gift -- The Untold Story of One of Maui's Ancient Treasures," a short documentary following retired educator and Hawaiian cultural specialist Ed Lindsey on his mission to save cultural places at a time when loss is taking its toll on the Hawaiian culture. Viewers will also be treated to "Haleakala: A Sense of Place," a story of how Haleakala, "House of the Sun," has risen from the sea to become one of the most diverse and breathtaking places on earth. Screenings will take place in the schools Namahana Dining Hall and courtyard, at 270 Aapueo Parkway in Pukalani. For information, call 808-572-3237.